Kevin Page is an author, actor, and holds a master’s degree in psychology. He writes about mindfulness meditation and other healthy mind/body training techniques that make us better actors and human beings. As an actor, he was blown away by a robot (ED-209) in the classic movie, RoboCop (1987), offered Jerry his “show about nothing” on SEINFELD, and played the character that ultimately shoots and kills “JR Ewing” on the 2012 re-boot of the TV series DALLAS. He has appeared in over 100 commercials, voice overs, stage plays, and industrial films throughout his 35-year acting career. For 2018, Page has three new books coming out, including: Advanced Consciousness Training (A.C.T.) 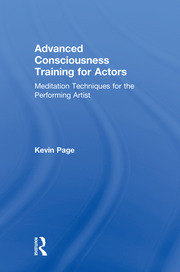 for Actors (Routledge), that teaches both stage and screen actors how to use various meditative arts to improve their abilities as performers; Psychology for Actors (Routledge), that applies 20th century post-Stanislavski psychological theories and techniques to the actor’s craft; and 150% Better Auditions (now available on Amazon.com), a popular version of his meditation system for actors and performers of any type. In addition to writing and acting, he has been a documentary filmmaker, stockbroker, investment banker, entrepreneur, gallery owner, and artist. He holds four U.S. patents on a technology that uses robotics and software to create large-format pointillist-style oil paintings.